With four generations simultaneously co-habitating today's workplace, miscommunication and dissatisfaction are prevalent. Generation Y is the newest generation to enter our workforce and they pose a whole new set of particularly thorny issues, especially when it is their elders who must manage them. So how can you, as a leader, help them reach their full potential? In The Gen Y Handbook: Applying Relationship Leadership to Engage Millennials Diane Spiegel takes a close look into the workings of the Gen Y mind—how they operate, their strengths, their weaknesses, and how to effectively engage the wide range of abilities at their disposal. 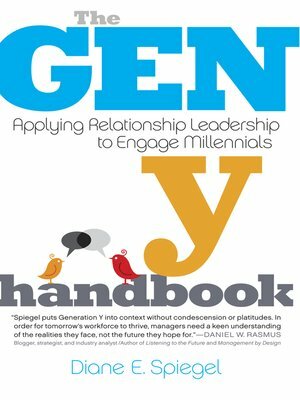 The Gen Y Handbook was written to help managers and business leaders avoid the pitfalls that multigenerational workforces can cause, while aiding in the implementation of the best techniques and most efficient ways of utilizing Millennial talent. Spiegel explains the particularities of Generation Y, why they are the way they are, and how to understand these differences without negative judgment.